We describe an approach to the management of location events deriving from a variety of sensors and sensor technologies. The approach uses a region-based spatial algorithm to integrate low-level location information, producing events that approximate closely to the needs of application programs. Preliminary experience indicates that the approach yields a very worthwhile reduction in the event traffic that must be handled by applications. R. Want, D. M. Russell. “Ubiquitous Electronic Tagging”. 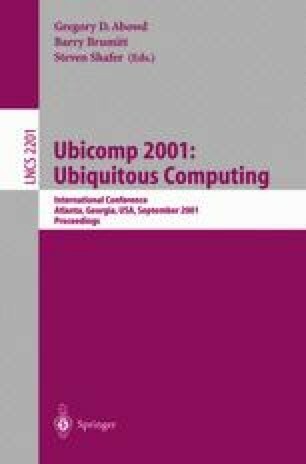 Distributed Systems Online, IEEE 2000. http://www.computer.org/dsonline/articles/ds2wan.htm.